Say hello to the Naturepedic Overture, an all organic, all natural latex mattress topper. The Overture is designed as the ultimate topper for healthiness and comfort. However, at $1,599 for a Queen size, the Overture isn’t a cheap investment. 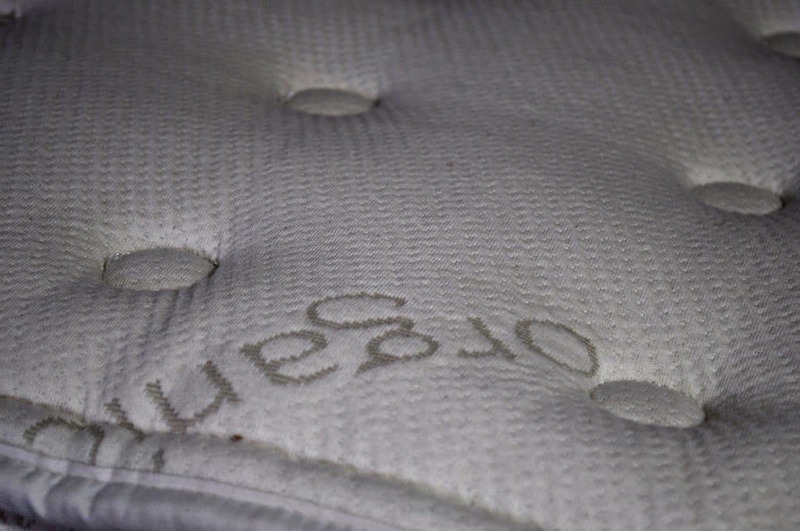 Can a mattress topper really be worth that much? We put the Naturepedic organic latex topper to the test to see how it performs in a variety of conditions. Continue reading below for the full review of the Naturepedic Overture organic latex topper. In a hurry today? Click to skip to the review summary. Naturepedic has taken great strides to create a truly exceptional above-and-beyond mattress topper with their Overture organic luxury latex pillow top. The topper is built using a combination of organic latex, organic wool, and organic cotton. The core of the mattress topper is a 2″ layer of all natural organic latex. Latex provides provide great comfort, pressure relief, and cooling. This layer of latex is wrapped in a thick layer of organic wool batting. The wool layer adds to the cloud-like softness and further improves the cooling and temperature regulation of the topper as a whole. Finally, the entire topper is covered in a stretch knit organic cotton fabric. The combined height of the topper is 3″. 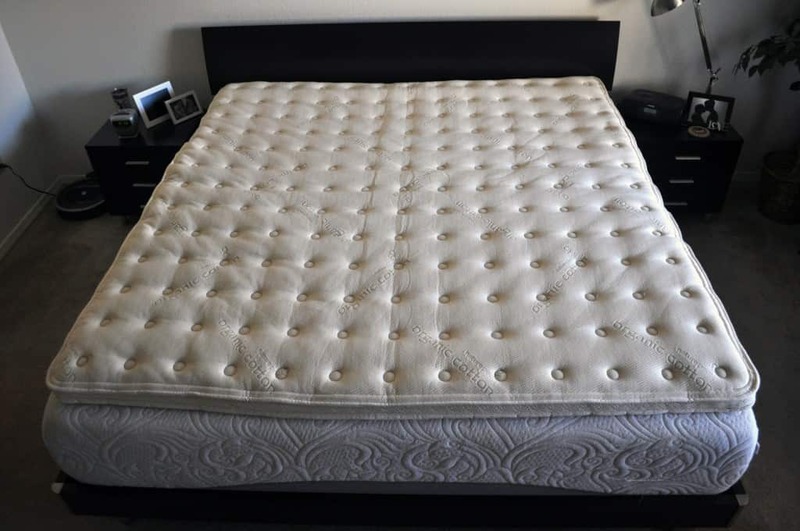 The Naturapedic Overture mattress topper looks and feels extremely well made. The seams along the entirety of the cover are tight, neat, and virtually flawless. The Overture is actually the exact same pillow top Naturepedic uses on their luxury organic mattress line. The topper is available in all standard sizes including: Twin, Twin XL, Full, Queen, King, and California King. The Naturepedic organic latex topper adds a nice degree of softness to any mattress it’s placed on. You can expect an increase of 10-20% on the softness scale. For example, if you were to place the topper on a mattress that had a softness rating of an 8 out of 10 (where 10 is the most firm) the feel with the topper would be around a 6.5-7 out of 10. For this review test, I conducted three separate sleep tests, using mattresses of different firmness. For the first test I used a slightly firm mattress, the Endy. The Endy is a very solid 7.5-8 out of 10 on the firmness scale. It’s a well made mattress, but it was too firm for my personal preference. Beyond my qualms about the firmness, the Endy’s support is quite good. Overall, I was very happy with the results of the topper when used on the Endy. It created a much more balanced and soft feel, while also relieving the pressure points that the Endy had previously created for me. With the topper the Endy felt more like a 6.5 out of 10 on the firmness scale. For my second test I used a medium firm mattress, the Leesa. The Leesa is a mattress that I already liked before the topper. It has a balanced feel and great support. The topper on the Leesa was pretty good. It softened up the Leesa from a 6 out of 10 to a 5 out of 10. I felt like the softness was a bit too much as a stomach sleeper. However, my wife liked the feel as a side sleeper. The increased comfort layer padding between the Leesa’s top comfort layers + Naturepedic’s organic topper upped the “cloud” like comfort significantly. For my last test I used a softer mattress, the Amerisleep Colonial. The Colonial is a 4 out of 10 on the firmness scale. Just like with the previous two tests the topper increased the softness, going from a 4 out of 10 to a 3-3.5 out of 10. However, the increased softness created a negative feel in this particular case. The Colonial already has a very thick comfort layer. The combination of the topper and mattress simply didn’t provide enough support for me. That said, feel and softness are of course subjective. If prefer this firmness level and/or are heavy enough to require the increased padding you may find it meets your needs perfectly. All things considered, the Naturepedic Overture latex topper adds a high-degree of comfort and softness to any mattress or other flat surface (I tried it on the floor as well, it’s not bad!). Based on my experiences using different mattresses at different firmness levels I feel like the topper will perform best on mattresses that are more firm than you need. The topper is a topper, not a miracle worker, so it will not add a dramatic level of support to your mattress. If your mattress is dramatically sagging, too soft, or doesn’t offer enough support it’s unlikely that the Overture will be the right choice. For mattresses that are too firm and simply need a little extra comfort and cushion it’s hard to imagine a better topper. The material quality quite simply could not be any better…organic latex, organic wool, and organic cotton. You will not find more healthy materials in any topper anywhere. 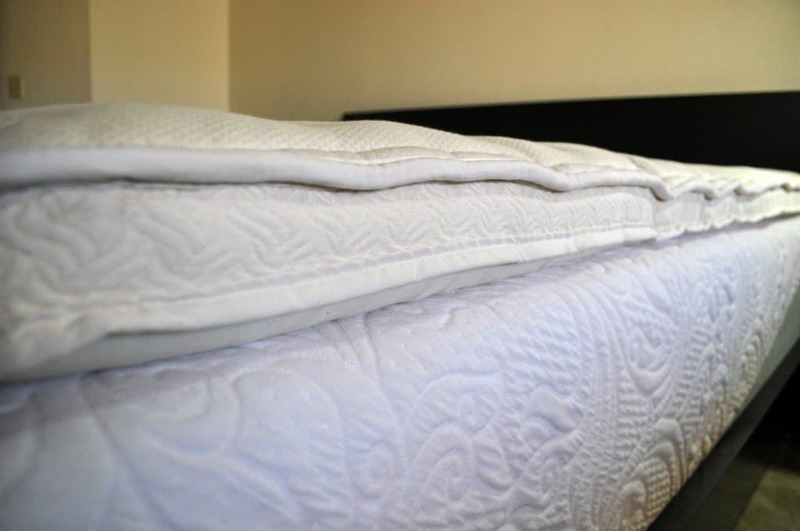 Should you buy the Naturepedic organic latex mattress topper? The Naturepedic overture organic latex mattress topper is an uncompromising product. There are no short cuts and no fillers. Naturepedic has selected the most healthy and quality materials for this product and it certainly shows, both in regards to performance and build quality. However, that uncompromising design also shows in the price. As such, it’s the type of topper that’s not for everyone, but for the right person can be ideal. Want the absolute most healthy topper available – with all organic / all natural latex foam, organic wool, and organic cotton you quite simply could not ask for a more healthy topper. Naturepedic’s materials are all certified by 3rd parties and are of the highest quality. 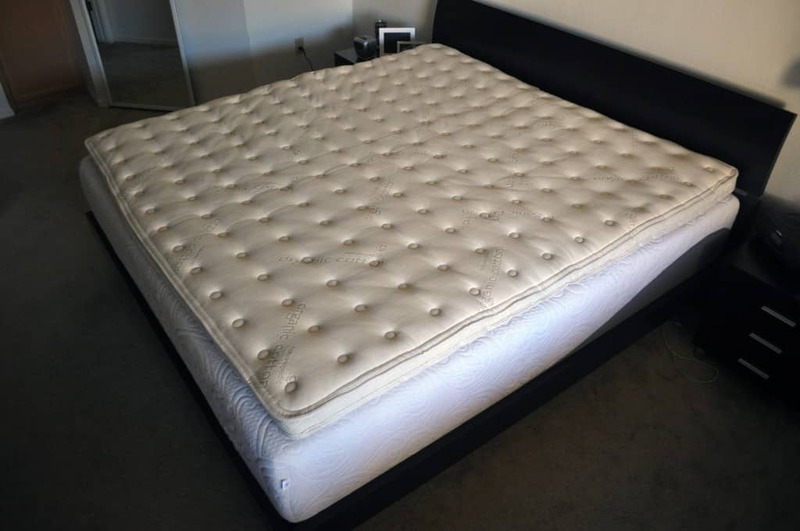 Have an ultra luxury mattress and want a topper to match – if you have a high-end mattress and don’t want to top it with an inexpensive topper this can be a good fit. The level of quality and performance is as good as any topper on the market. Have a mattress that’s too firm – like all toppers, this topper is not going to improve the support of your mattress. However, what it will do is add comfort and softness. If your mattress is simply too firm and creates pressure points the topper can increase the softness by 10-20%. For more information on the Overture organic latex topper visit Naturepedic.com. The Naturepedic Overture organic latex mattress topper is a product of uncompromising quality and materials. Built with 100% organic latex, 100% organic wool, and 100% organic cotton it’s one of the most healthy products I’ve ever tested. The build quality is impressive, with virtually flawless stitching and a clean tight look from seam to seam. The only con is simply the price. At $1,599 for a Queen it’s a topper that’s not for everyone. If you, like the Overture, have uncompromising needs and tastes it’s hard to imagine a more quality, healthy, or better choice.